Eagle-Vail’s Mikaela Shiffrin claimed victory Sunday in the US Nationals GS in Sun Valley, Idaho (US Ski Team photo). The 2015-16 World Cup ski racing season was a strange one for both Vail Valley superstars Lindsey Vonn and Mikaela Shiffrin. 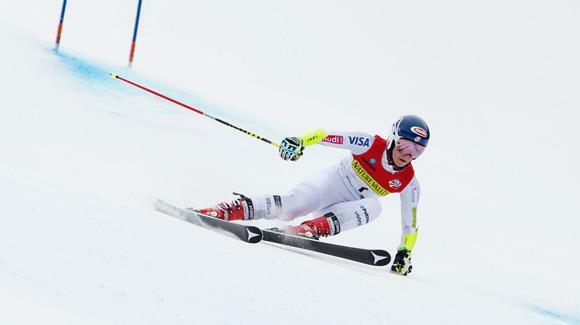 Vonn’s ended in injury with an overall title in her grasp, and Shiffrin might have competed for that title as well if not for a mid-season injury. Shiffrin, an Eagle-Vail resident who recently turned 21, managed to come back and end on a high note with three World Cup slalom wins in February and March, and on Sunday she claimed a rare giant slalom victory in the U.S. Nationals in Sun Valley, Idaho. It was the second time she’s won an American title in GS — a discipline she’s claimed victory in only once on the World Cup circuit. During her short but amazing World Cup career, two-time world champion and Olympic slalom gold medalist Shiffrin has won 19 World Cup slalom races and one GS, and she won five times this season, surpassing Tamara McKinney for second on the all-time wins list among American women. First on that list, of course, is Vail resident Vonn, the 31-year-old Olympic downhill gold medalist who holds the all-time women’s victory record with 76 — nine of them this season. Speaking of sponsors, Rocky Mountain Post partner RealVail.com caught up with Shiffrin over the holidays and wrote a piece for ESPN.com on the progress of her rehab and her goal of returning to the World Cup circuit by March. Clearly she reached that goal. When she injured her knee in a training run at Are, Sweden, in December, Shiffrin was just four points behind Vonn in the overall World Cup chase. After not racing for more than a month, Shiffrin was still 15th. When RealVail.com first talked to her in person at the Westin in Avon during a media event hosted by her main sponsor, Barilla Pasta, Shiffrin was coming off two huge wins in Aspen and was poised to compete for the overall chase. Really, can you be a fan of both? Apparently if you’re an Olympic gold medalist ski racer, that is allowed. RealVail.com also asked her about her social life for People Magazine, which took a pass on the information that she’s not currently dating. Clearly she should have hung out with Taylor Swift over the break. ESPN.com also cut out reference to who she’s dating (or not) these days. She was busy rehabbing relentlessly, especially after Dr. Bill Sterett of Vail Summit Orthopaedics, Vonn’s previous doc, found a hairline fracture in her knee on top of deep bruising and an MCL tear. Shiffrin said she considered taking some time off and going somewhere warm but opted to stay home with family and rehab hard in order to get back by March. That drive clearly paid off when she earned more points in speed event (super-G), got her GS back on track at nationals, and continued her utter dominance in slalom at the World Cup finals.